WINNIPEG- WinnipegREALTORS® noted the 2011 third quarter was quite exceptional so a formidable foe to outperform in 2012. July 2012 proved this point. When it came to the finish lineMLS® sales fell short by less than 2% or 21 sales. Dollar volume was the reverse as July 2012 eked out a narrow victory over July 2011 by a little over $6 million or 2%. Close for sure on both accounts and while neither years’ set all time best sales records for this summer month they both are slightly better than the 10-year running average of 1,223MLS® sales. Fastest to the finish line in record fashion is the year-to-date dollar volume. Never before has WinnipegREALTORS® in its 109-year history transacted $2 billion inMLS® sales in the first seven months of the year. With five months to go and a cushion of an 8% gain over the same period last year the potential for another annual dollar volume record which will eclipse $3 billion for only the second time is well within reach. As for year-to-date listings entered on theMLS® system, another tight race is emerging with 2012 just going over 12,000 listings. 2011 was still under 11,800 listings by the end of July. JulyMLS® unit sales decreased by less than 2% ( 1,225/1,246) while dollar volume was up 2% ($294.4 million/$288.1 million) in comparison to the same month last year. Year-to-dateMLS® sales are ahead by 3% (8,146/7,906) while dollar volume has increased 8% ($2.00 billion/$1.84 billion) compared to the same period last year. The most active price range for residential-detached sales continues to be the $250,000 to $299,999 price range with 23% of total sales. Not far behind are the two lower price ranges from $200,000 to $249,999 and $150,000 to $199,999 with 19 and 17% respectively. 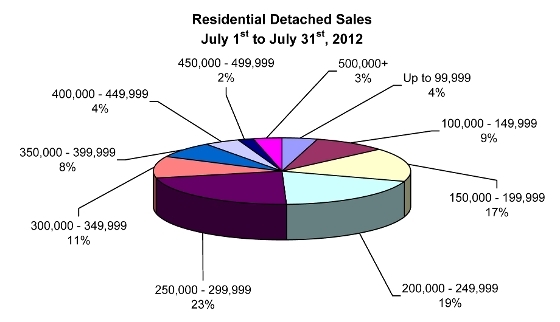 July 2012 showed how diverse WinnipegREALTORS® housing market is with house sales of $1,329,000 and $12,500. Condominium sales activity is most prevalent in the $150,000 to $199,999 price range with 35% of total sales. Average days on market for July residential-detached sales was 26 days, 2 days slower than last month and a dead heat with July 2011. Average days on market for condominium sales was 41 days, a full two weeks slower than last month and July 2011.